it was another gloomy day, not brightened by us finding that there was no breakfast supplied with our room – we wished we had drunk more of the port…… In the event we decided not to wash up the port glasses as a small protest as they had advertised themselves as providing bed and breakfast and wifi and we had experienced neither! It was still not the brightest of days with intermittent showers, but the first stop we made was at the sign that said ‘London Bridge’ it had to be done! There we found ourselves peaking over the crashing waves surrounding a huge part of the coastline that had broken away and formed a sizeable arch – London Bridge! Despite the glares of a Japanese chap photographing his wife very seriously avec tripod and a very large lensed camera, we took our snaps and withdrew with the distinct feeling we had ruined their photo shoot and that those tripod legs would be snapping shut in irritation behind us! 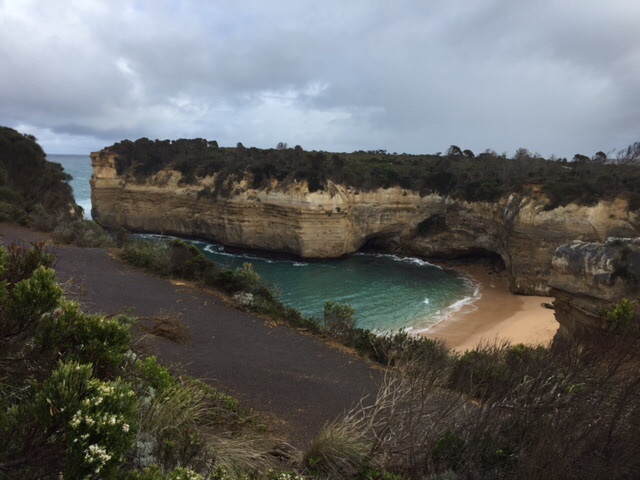 Next stop was Loch Ard Gorge – a truly incredible inlet that had borne witness to many a shipwreck. By now we were finding people – though in fairness it was only one or two – at the sights we stopped at. To date we had had the place to ourselves! 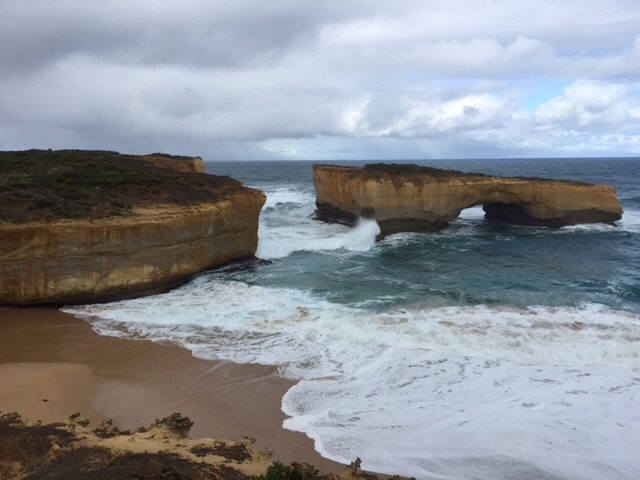 The next stop was for the big one -the Twelve Apostles (to be frank I could only count 9 ….) – a really impressive sight – but shared by loads more people! Where had the come from? We had seen no one on the road – and then we realised they were coming the other way! 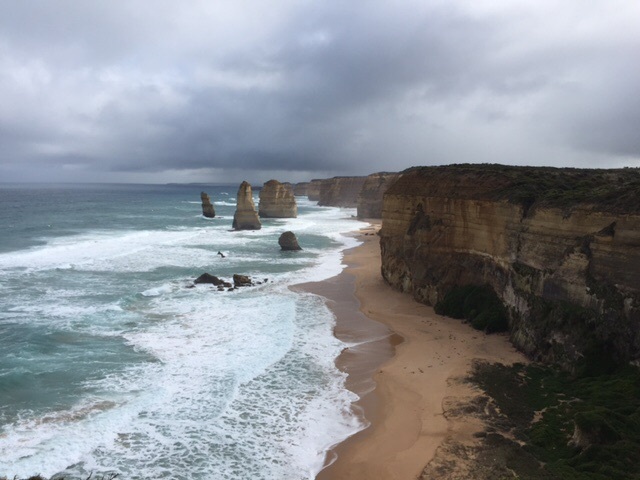 Apparently – at a push – you can do Melbourne to the Apostles in a day!! Mystery solved. Regrettably the weather was not great at this point, but the rain held off for us to get a good view of them, but we did not walk down to the beach but decided to have lunch in the car instead. To date we have been quite thorough but 86 steps down to a wet beach in the rain did not seem attractive ……. mystreiously we then left the coast and had a very meandering drive in land. Thank goodness for an automatic car as we twisted and turned around hillsides. I thought it reminiscent of the Dordogne lush green vegetation and winding roads And then at Apollo Bay we came out onto the coast again.. The sun came out and it was glorious. We drove along the road next to the sea as the waves crashed onto the shore the terrain was still very much up and down and twisting and turning but now we had the sea at our shoulder all the time – the true Ocean Road. 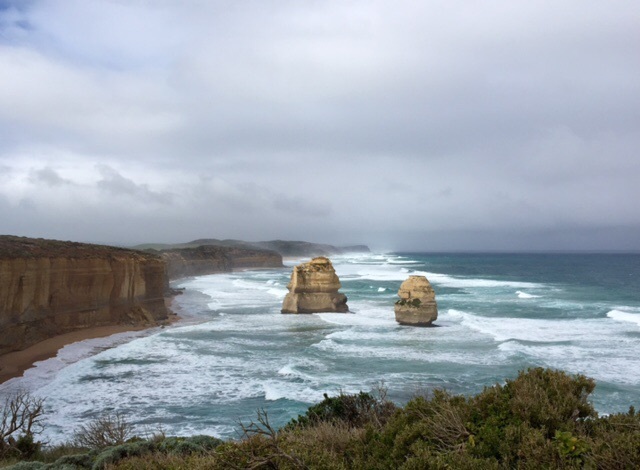 We passed through Lorne, Anglesea and Torquay – all quite large townships on the road and then we left the sea again and the Great Ocean Road with its shipwrecks and history was behind us and signs to Melbourne became more prominent. We had decided to stay at Queencliff, a truly Victorian town across the bay from the Mornington Peninsula in readiness to take the ferry on Saturday morning en route to Melbourne. We checked in to the truly Victorian hotel who said we could have a room and shared bathroom (one bathroom between three rooms….) or we could have the small apartment across the road. We opted for the apartment. However we did enjoy a very good meal at the hotel in front of a roaring fire! Hi there sorry about the long silence but life here has been pretty full on. Space making has been pretty full and quite successful. However at the same time we have had to empty the conservatory for the erection of the new roof. So we have rather full lounges and main room at present. On the other hand it gave the opportunity for some crafty culling along the way. We had a surprise telephone call from the roof people on last Wednesday to say that they were coming to work on the brick wall. It was the first that we had heard of it! It turned out to be relatively painless. The two young guys were great worked really hard and soon became honary family members. The main body of work takes place from tomorrow, Tuesday to Friday, then plastering and painting the following Monday and Tuesday. On the human side of the enterprise some really good news. Aidan has almost certainly got a job with Aldi. The pay and hours are good, he has his final interview on Saturday. Jon has been through some dramas at work which weren’t of his making but all seems OK. He apparently is likely to be the top selling salesman for the last financial year of which he has only been there for 6 months. They have plans for the next stage of smartening up there area. …….and Steven brought his new lady, Jill, to see us and stay for dinner. She is very pleasant. They met at the gym. They will join us when two of my nieces come for lunch on Sunday week at our Kent dacha. So back to the work in hand. Enjoy Melbourne. We really liked it. Lots oflove Mick and Lesley. It’s never too early (or too late) for cheese!